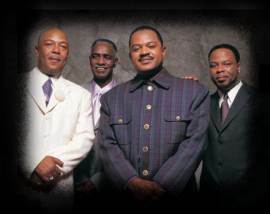 The hit single from Gospel’s upper echelon quartet, The Canton Spirituals, has a head-snap zinger of a title that falls into that tried and true device common to quartet songwriting, attention-getting song titles aimed at drawing notice. The group's lead singer, Harvey Watkins Jr. uses popular idiom derived from one of today’s most dominant societal ills to put a unique spin on the story of how his mother ‘drugged’ him to church and ‘drugged’ him to Sunday School, leading to baptism. The song is essentially a song of thanks to parents and to God. is the only thing that’ll take care of you. 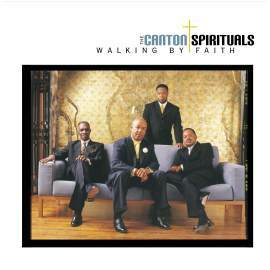 “Drug Me” is but one of a multiple number of songs from the Canton’s latest album, Walking By Faith that infectiously draws attention. Overall, it’s an album characterized by the beloved sound of these Southern four, that snug combo of warm and comforting luscious harmony, tear away leads and Gospel drive. There’s a great set of live, horn-touched cuts, including the album opener “I Feel The Spirit” and “Church Is Gonna Make It”, with the brassy sass contrasting with Watkins Jr.’s lead vocals and his nephew Cornelious Watkins’ work on lead guitar. Together with Merlin Luscious and 'Pig' Thompson, The Canton Spirituals are consistent in their approach, reliant on the vocal tradition of their Mississippi upbringing but never hesitant to move their legacy into an aural surrounding consistent with the best of millennial production. Check that out on songs such as “Never Let Go”, a ballad enveloped in a rhthym ‘n praise vibe as sweet as you’ll ever hear, and brilliantly solidified by the guest vocals of Glenn Jones and Genobia Jeter Jones. Jones’ soaring soul here makes one pine for the days when he used to sing exclusively Gospel. “Home Church” and “Softly and Tenderly” prove that the blend of the Canton’s vocal sound is probably as smooth as human frailty will allow. As soothing to the ear as soft chocolate is to the mouth, the former cut lays tribute to the haven comforts of one’s own church home. “‘Been Good” slams a solid quartet rhythm into the project, bringing the group back to roots. That real down-home feel is further enhanced by the harmonica work of the noted Bobby Rush. “Holy Ghost Guitar” rocks the house with its very edgy, searing instrumental sound. This is a showpiece for Cornelius Watkins, as he wrote the song and takes both lead vocal and guitar duties. Another song to mention is “Redeemed”, with its sermonly intro about glorifying God in our bodies and in our spirit, because we have been bought with a price. Perhaps the Canton Spirituals hit so very hard because their style and their approach is from the very core of their being. Certainly their Gospel message is. All content in GospelFlava © copyright 2002. No information to be reprinted or re-broadcast from this site without the expressed written consent of GospelFlava.com. All rights reserved.